WiscWeb uses the Duplicate Page plugin to allow users to quickly copy pages or posts that you have created. This will be especially helpful when you create a layout that you are happy with and want to use it again. 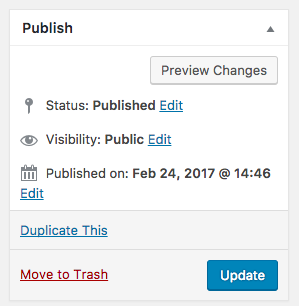 To duplicate a page or post, first go to edit the specific page or post that you are wanting to copy. In the right section of your screen, within the Publish are, click on the Duplicate This link. Once you have clicked that link, you will be brought back to your list of pages or posts and you should see a new page or post with the same title as the one you duplicated in Draft status. Click on that page or post to access it. In the page or post, give it a new Title at the top and also be sure to change the Permalink value as well. It will simply add a number next to the Permalink (URL) value, which will not help with search optimization. URL values should have lower case characters, and use a hyphen to represent a space (for example, change-this-title would be an appropriate Permalink value to use). Once you have made your updates and changes, click Save Draft to keep the page in draft status and continue updating, click Publish to make the new page or post live, or click Update to make any new updates live.